"Clear and Simple as the Truth is an island of elegance. This book won't tell you about working in publishing and doesn't mention the Internet. It goes back to the source - the reason many of us got into this field in the first place - a love of language, of thoughts perfectly expressed, concepts elegantly communicated. When the authors say that the Audubon Society Field Guide to North American Birds is the epitome of classic writing, we believe them. We believe almost everything these authors say, because they say it so incredibly well." "This marvelous little book avoids the inevitable arguments that arise from even the best How To and How Not To books. It does this by describing some fundamental questions that they identify as the elements of style and by illustrating the way that classic style can be defined by a particular set of answers to those questions. Stimulating, fresh, invigorating. I recommend it highly." "Clear and Simple is not just an almost peerless manual of style. Like George Orwell's 'Politics and the English Language' and Herbert Read's English Prose Style, it uncovers the intricate relationship between literary expression, mental power, ideological bent, and personal character. It does this by close analysis of brilliantly chosen texts in several languages. Since it is itself an exhibit of classic style, it is a delight to read and reread." — Richard Stern, novelist and professor, The University of Chicago. "As Francis-Noël Thomas and Mark Turner argue in this intriguing (for those of you who share my enthusiasms, I'll go so far as to call it thrilling) volume, learning to write is inevitably to learn styles of writing. This is a rigorous, extraordinarily captivating book, which, in its acute attention to the intellectual assumptions that shape prose style, has much to teach anyone caught in the web of words." — James Mustich, Jr. in A Common Reader. Go to full review. "The most popular book on prose style is The Elements of Style by Strunk and White; I recommend it, although it is preoccupied with usage, punctuation, and grammar. The best book I have read on the substance of prose style is Thomas and Turner, Clear and Simple as the Truth; it deals mainly with one specific style, although others are considered along the way." — Herbert S. Bailey, Jr., former director of Princeton University Press. "Clear and Simple as the Truth has a scope and relevance that exceeds its ostensible subject. It is a treatment of classic style that manifests the virtues of the writing it propounds, expounds, and exemplifies in a wealth of fascinating passages, brilliantly analyzed." "Could well be the most important discussion of style since the great classical rhetoricians. It will certainly join the small list of style-guides that are permanently useful." "Clear and Simple as the Truth is a work of great intellectual elegance and power. I have read it with a lot of pleasure, admiring the wisdom and economy of its reflections and the extraordinary range of its citations. Thomas and Turner have made a powerful case for civilized and intelligent discourse, and have done it without hectoring or polemical reductiveness." "Clear and Simple as the Truth holds the promise of raising the level of the nation's prose. Thomas and Turner will have the literate nonacademic reader on their side from the outset and will win over most of the others through the sheer force of their passage-by-passage analysis. The book is full of cogency and insight." "The best-known book about writing, Strunk & White's The Elements of Style, offers an elaborate list of do's and don'ts. Individually, these capsules of advice can be useful, but learn them all and you still won't know how to write. 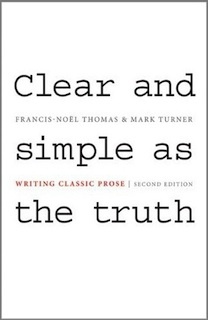 Francis-Noël Thomas and Mark Turner have taken an entirely different approach in Clear and Simple. . . . [I]t is filled with enough general advice to benefit anyone who writes anything." — Christopher Ott, Writers' Journal. "Every once in a while a book comes along with the power to alter permanently the view of a subject you thought you knew well. For me this year, that book is Clear and Simple as the Truth: Writing Classic Prose."